SOUTH EASTON, Mass. – After Foxboro opened the scoring in the first half, it took King Philip just two minutes to respond and erase any momentum the host Warriors had. But in the second half, the Foxboro retook the lead, it made sure it didn’t let its foot off the gas. The host Warriors scored three goals inside the first 20 minutes of the second half, blowing open what was a tie game into a 4-1 victory over KP on the turf at Southeastern Regional High School. “We had a lot of positives in the first half so we needed just to keep going,” said Foxboro head coach Joe Franchino. ” One thing we stressed was that we can’t concede goals right after we score, that was a main focus for us. We just kept going at them in the second half, started knocking the ball around out of the back. After a back-and-forth opening 10 minutes, Foxboro jumped ahead in the 11th minute. Nic Beigel won a ball in the area at midfield and played it up to senior Shane VandenBoom. VandenBoom took a touch and then latched onto a volley on the bounce, getting enough pace on it to catch the KP keeper just off his line for a 1-0 advantage. But Foxboro’s lead didn’t last long as King Philip netted the equalizer in the 13th minute. Sophomore Cam Lawrence delivered a near post service, and senior Gavon Fox did a nice job challenging for it, causing the ball to bounce free. Senior John Cullen got a touch to the loose ball, forcing a low save from Foxboro keeper Nick Penders but the rebound fell right to Fox, and he buried it into the open net to make it 1-1. “I was really impressed with our ability to respond,” said KP head coach Nick Gale. “Gavon and John did a nice job in the box to create something, and that’s something we’ve expected of ourselves but haven’t done frequently, so I was happy about that. It was just about keeping up that momentum and energy, and we didn’t capitalize on it. Although neither side found the back of the net by the time half rolled around, it wasn’t for lack of chances. Foxboro junior Joe Cusack nearly scored twice in a two-minute span while KP’s Tony Bozza nearly gave the visitors the advantage in the final seconds of the opening frame. In the 37th minute, Will Morrison‘s big switch to VandemBoom was partially cleared, with Cusack knocking the ball down and unleashing a shot that forced KP keeper Nick Beltramini to lunging stop. Two minutes later, after a clearance on a corner, Cusack fired a laser to the far post, but once again Beltramini was there for the top. And in the 40th minute, KP nearly cashed in on the counter attack. Cullen took possession over midfield and found Bozza darting up field. The senior went central with his first touch and ripped a low shot from outside the area, but it slid wide of the post. It didn’t take long for the chances to come in the second half. In the 47th minute, Cusack delivered a corner that Beltramini got his hands to but wasn’t able to clear. The ball bounced back into the middle of the area, and junior Tim Behn was the first one there and knocked his first career goal in from in close. Foxboro didn’t let King Philip come back with an equalizer this time. Just five minutes later, the host Warriors added to their lead. Cusack played VandenBoom down the left side, and he delivered a perfectly weighted cross to the penalty spot and junior Dylan Barreira one-timed his bid into the back of the net. And seven minutes after that, Foxboro’s pressure turned into another goal. Barreira’s high press resulted in a turnover and a breakaway. KP’s defender went in with a slide tackle and got some of the ball but more of Barreira, leading to a penalty kick. Barreira got his second goal of the game by sliding his shot low right. With the win, Foxboro boys soccer moves back to .500 overall (5-5-1, 4-5-1 Hock). The Warriors need seven points from their final seven games to qualify for the state tournament. They next play on Monday night against Milton back at Southeastern. 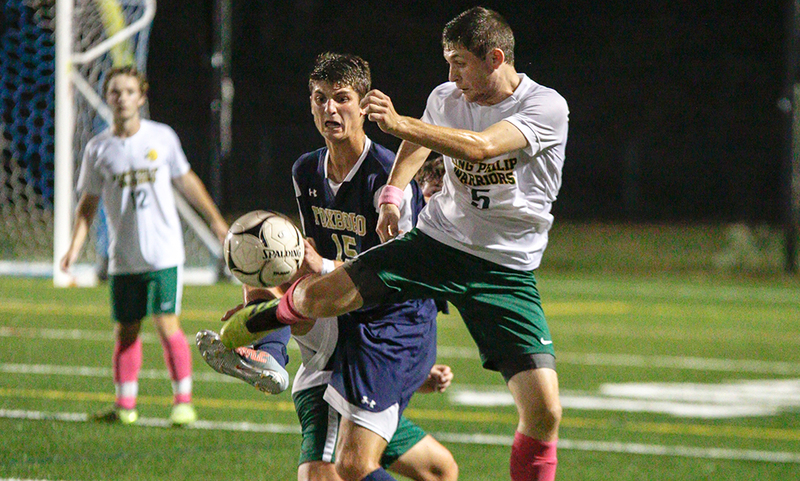 King Philip (3-8-1 overall, 3-7-1 Hock) returns home on Friday afternoon and will entertain Franklin.